Boat and RV storage facility financing, including ground up construction, is available with as little as 10% down via the SBA 7a program. Almost all of the same guidelines apply to boat and rv storage as for self storage facility financing including the fact that the 10% down payment can come from borrowed funds. The loans are available for both indoor climate controlled or outdoor storage which can be anything from a large lot with fencing, lighting and a small office to a high end climate controlled building. See bottom of post for note about RV parks, campgrounds, resorts, marinas and storage. For outdoor storage, some lenders will require some amount of structure on the property – typically some canopies for covered storage – and others are okay with less in the way of improvements. As a general rule, the more basic the property, the better the location or the stronger the transaction needs to be. In other words, if it is an existing business, then the financials for the last few years need to show good cash flow. If construction, then the business plan and location need to be solid. If it is a refinance then solid income for the last few years will do the trick. It is not required that you have experience in the industry – especially for smaller loan amounts up to a few million dollars. Lenders understand that the storage business is less complex than other types of businesses and requires less hands on management, so they allow for those new to the industry to get loans. Basically, a lender wants to see that you have enough real world experience to handle owning (and possibly managing) a facility. They also want to see that you have a consistent source of income. The last thing they want to do is put someone in a position to be overwhelmed because they made them a loan. Loan amounts can be quite large depending on which loan program you go with and how much you can put down. Realistically, maximum financing with 10% down would be approx $9 million give or take $500K and projects between $5 million and $10 million would have to be quite strong, because the SBA is now requiring that a facility get to breakeven within 24 months of opening. This could be a challenge for larger projects with larger loan amounts. Ideally, all principals should be strong financially, have solid credit and good jobs/business ownership experience. A significant net worth is NOT required, but for larger transactions you will typically need some amount of post-closing liquidity to give a lender a level of comfort. In some cases a feasibility study is required. If you are building a facility some lenders will allow you to build into the loan enough working capital to make the payments for the first few years. This is significant in that it allows you to come in with just 10% on the total project costs and allows you to focus your energy on ramping up occupancy. The 10% equity injection can be from funds that you borrow (assuming you have “outside income” to pay it back), equity in other projects/facilities, cash from investors, gifts and in some cases, a retirement account can be used tax and penalty free. This is a very flexible guideline and one that can make a lot more transactions possible, but there are caveats so it is best to discuss your individual case in detail. You can have (old) bad credit (BK’s, foreclosures, charge offs, etc.) and still possibly qualify. This would be evaluated on a case by case basis, but if you can show that whatever happened in the past was an isolated occurrence and the reason for what happened is acceptable to a lender AND you can show that you have “recovered” you will have a shot. Occasional sporadic late payments and mid 600 credit scores are NOT deal killers, but a lender won’t approve a borrower with a pattern of financial mismanagement. (Bankruptcies need to be at least 5 years old – typically). The prepayment penalty is very short and reasonable. You can pay off the loan after just 3 years with no penalty or after 2 years and pay just a 1% penalty, so if your plan is to get a facility built, ramp up occupancy and then either sell or refinance then you can do that. 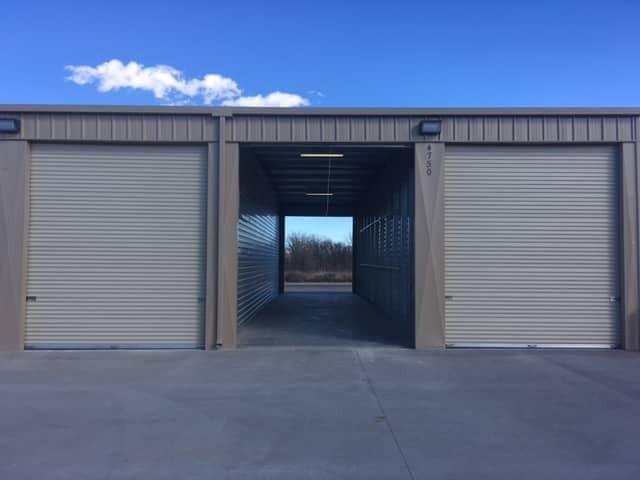 There are numerous other advantages and “caveats” and for the full list you may want to visit my post about SBA self storage financing. Bottom line – this is an extremely viable form of financing if you want to capitalize on the large segment of the population that plans to purchase or currently owns a boat, rv or other vehicles and you are looking for maximum leverage. SBA loans can be used to finance not only the storage facility but solar covered canopy installation – and all over 25 years. A solar covered canopy can be an excellent investment in many parts of the U.S. as many states and municipalities provide incentives for various forms of renewable energy. As of 2019 there is a still a 30% Federal Tax Credit for solar installation and most states have a “net metering” program. Net metering is part of what utility companies call “distributed generation” where electricity customers are able to sell the “excess” electricity they produce on site at their business back to the utility in return for a credit on their bill. SBA financing is also available for RV Parks, Marinas, Resorts and Campgrounds if more than 50% of the revenue of the business is from “short term stays” (customers who stay for 30 days or less at a time). I mention this because it is not uncommon that these types of businesses to have either RV or boat storage on property and it is possible to finance the construction or expansion of a facility as part of a business expansion, acquisition or startup of an RV Park, Marina, Campground, etc. Just keep in mind that for a startup your business plan and projections must show that more than 50% of the revenue will come from short term stays and for acquisitions and startups the SBA requires a minimum 10% down payment or equity injection but as mentioned above, there is flexibility in where the down payment can come from. 100% Investment Property Financing. Is it Possible? SBA 504 Refinance Loan Is Back! SBA 504 Refinance – Is the 90% LTV Program Coming Back? ©2009-2019 sba504blog.com. All Rights Reserved.